P2	P6	P7	P9 What are Natural Resource Charter precepts? Nigeria's national oil company, the Nigerian National Petroleum Corporation (NNPC), sells around one million barrels of oil a day, or almost half of the country's total production. NNPC oil was worth an estimated $41 billion in 2013, and constitutes the government's largest revenue stream. Early in 2014, Nigeria's central bank governor Lamido Sanusi raised an alarm that $20 billion in NNPC oil sale revenues had gone missing. Eliminate Nigeria's Domestic Crude Allocation. Stop the discretionary retention of revenues by NNPC and its subsidiaries. Fix the oil-for-product swap agreements. Rid oil sales of unnecessary middlemen. Improve NNPC's transparency and corporate governance. 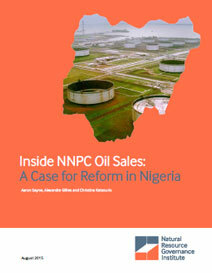 The report also proposes that a second, more medium-term track of reform is needed before NNPC can begin serving the public interest: the tackling of the corporation's underlying structural problems. Below are several of the primary documents that informed the analysis contained in the report. The report contains full citations for the many other documents we utilized, a number of which (such as NNPC Statistical Bulletins and NEITI reports) are publicly available.